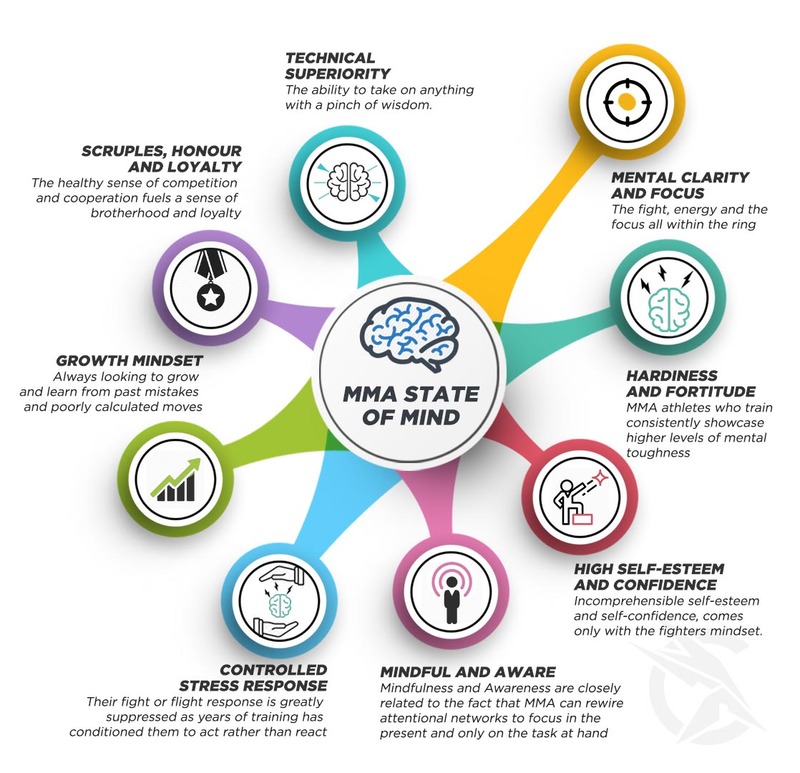 MMA State of Mind: What is the fighters mindset? Are you curious about what it looks like inside the minds of the MMA fighter? Why do they seem to be so grounded, level headed and yet a class apart? What goes on in their heads when they are fighting for practice, fighting for fun or fighting for competition? Do their minds work differently than ours? If so, How different? Can we call this the ‘Fighters Mindset’? Mixed Martial Arts is taking the world by the storm, the mixture of multiple cultures and the role it plays in this art form has caused many scientists and researchers to study the progress of MMA along with its benefits rather closely. MMA and its components are being studied from every angle as well as being compared to non-MMA practitioners allowing an accurate appraisal and the helps define the niche that is carved for the art form in the modern world.The ancient techniques and practices have been streamlined to offer the best from every culture, contributing to the toughened and resilient man. Seasoned MMA fighters paint a picture of clarity and razor sharp focus, be it inside or outside the ring. This is unique cognitive control, exercised by hours of training and discipline is vital for the fighter to keep the reflexes sharp, improvise and think on their feet. This remarkable trait spills over to every other aspect of life ensuring excellent decision making and life skills. MMA athletes who train consistently showcase higher levels of mental toughness, hardiness and fortitude in scenarios where life may not be handing them lemons. They cope better with adverse situations, losses and are increasingly able to showcase fortitude in situations where bravado is preferred over an emotional response. The levels of mental toughness seem to differ depending on the time an athlete has spent in training and how well honed their skill set has become. Ever noticed that air around a fighter? The untouchable yet mysterious one? Yes, that is one of the incomprehensible self-esteem and self-confidence, which only comes with the fighters mindset. You’d have to follow an impeccable self-discipline to understand it. The levels of self-control that is exercised through sheer will-power wires the brain to feel just right about everything prodding them to hold themselves and their doing in high esteem and confidence. Mindfulness and Awareness are closely related to the fact that MMA can rewire attentional networks to focus in the present and only on the task at hand. A collective emphasis of the mind and body to bring and hold attention to a particular attack or defense, while muscle memory automatically plans and predicts with mental calculations guarantees that the wandering mind is not acceptable in the ring. This quality is a precursor for great physical and mental health, high quality of life and ability to discern and build the future. Very rarely would you see a seasoned MMA athlete lose their cool. Their fight or flight response is greatly suppressed as years of training has conditioned them to act rather than react to opponents and advertently life situations. You will never meet someone who is more attuned to growth than an MMA athlete. They are always looking for the silver lining in situations, to grow and learn from past mistakes and poorly calculated moves. The need for achievement rides high with this pack. The credentials of the MMA values take high stand with undying loyalty to the team. The healthy sense of competition and cooperation fuels a sense of brotherhood and loyalty, creating the glue which redefines and glues together- The fighters mindset. MMA is an art form which is carefully tailored to integrate only the cream of the techniques and it shows. The skilful navigation of an MMA athlete in a fight and life alike are a mirror of the ability to take on anything with a pinch of wisdom. Next time you meet an MMA athlete along your way, stop to pay attention to the rigorous pieces of the jigsaw that make them who they are. Staying Hydrated: How drinking enough water can help you achieve peak perfo... MMA for your Mental Health.